The National Optical & Scientific Instruments 430-430-PHF-10 Stereo Microscope features a superb illumination system with an incidental lamp for illumination right where it's needed most. Transmitted illumination is fluorescent, providing both a high output of light and a cool running temperature to prolong the life of live specimens. The 430-430-PHF-10's optical system consists of a two widefield 10x eyepieces, inclined at 45°. 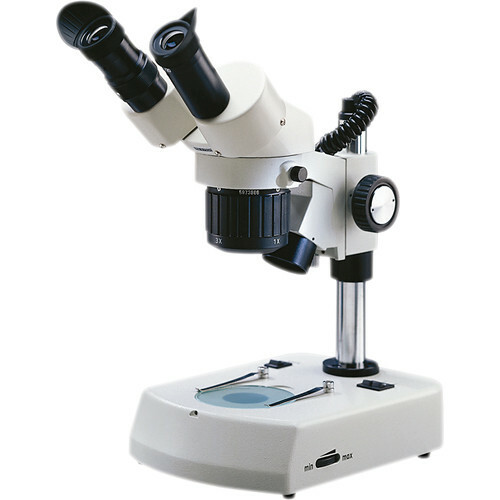 The eyepieces sit on a 360° rotatable viewing head for sharing with colleagues. Magnification is changed by rotating the objective turret 90° to positive click stops. The top light is a 12V halogen bulb, while the bottom light is the aforementioned 120V fluorescent. A 4 position light control allows the user to control illumination by having just one light on, both lights on, or by turning them both off. The base on the microscope also provides the user with a number of features, including two frosted 80mm stage plates with a reversible black/white plastic contrast plate. A blue filter also helps for transmitted light. Locked-on stage clips keep specimens securely on the stage. For better viewing of specimens this model in the 430 series has rack and pinion focusing with slip clutch and tension adjustments. Additionally, a heavy-duty post mount with a locking collar allows for up and down adjustments of the viewing head.